This group is for players with some experience of playing the ukulele. For those who would like to try the instrument for the first time, there is a second group, aimed at helping those just starting off. The joy of the ukulele is that, with just a few chords, it’s possible to play and sing along very quickly. During the first part of our session we practise songs which may introduce new chords or strumming patterns. Songs range from rock, folk, pop traditional and show songs. After tea and a chat, we play some familiar favourites for fun; it has been known for us to have some fun during the first half too! Although it seems a long way off, we’re beginning to practise the songs we’re hoping to perform at the December monthly meeting. We’re very fortunate to be joined by the Singing For Fun group for some of the songs. For the first time, we’ve had a break through August, so despite best intentions to practise, some of us may be a little rusty when we meet again on 14th September! The group meets at 2 pm at Chilwell Road Methodist Church on the second and fourth Thursdays of the month. This group is for players with some experience of playing the ukulele. For those who would like to try the instrument for the first time, a second group has been formed, aimed at those just starting off. The joy of the ukulele is that, with just a few chords, it’s possible to play and sing along very quickly. During the first part of our session we practise particular songs which may introduce new chords or strumming patterns. Songs range from rock, folk, pop traditional and show songs. As well as a range of strumming patterns, we attempt finger-picking, which we’re planning to develop further. After breaking for tea and a chat, we play some familiar favourites for fun; it has been known for us to have some fun during the first half too! The group meets fortnightly on Thursdays, at 2 pm at Chilwell Road Methodist Church. This group is for players with some experience of playing the ukulele. For those who would like to try the instrument for the fist time, a new group has been formed, aimed specifically at beginners. We wish them well and hope that they learn and laugh as much as we do! The joy of the ukulele is that, with just a few chords, it’s possible to play and sing along very quickly. During the first part of our session we practise particular songs which may introduce new chords or strumming patterns. Songs range from rock, folk, pop traditional and show songs. As well as a range of strumming patterns, we attempt finger-picking, which we’re planning to develop further. After breaking for tea and a chat, we play some familiar favourites for fun; it has been known for us to have some fun during the first half too! Recently we’ve been practising for a short performance at the March Groups Fair and hope that by the time this newsletter goes out, members of the audience will have enjoyed singing along with us. The group meets fortnightly on Thursdays, at 2 pm at Beeston Methodist Church. The group meets fortnightly on Thursdays, at 2 pm at Beeston Methodist Church. There has recently been considerable interest in learning to play the ukulele, so a new group has been formed, aimed specifically at beginners. We wish them well and hope that they learn and laugh as much as we do! The joy of the ukulele is that, with just a few chords, it’s possible to play and sing along very quickly. During the first part of our session we practise songs which may introduce new chords or strumming patterns. Songs range from rock, folk, pop traditional and show songs. As well as a range of strumming patterns, we attempt finger-picking, which we’re hoping to develop further. After breaking for tea and a chat we play for fun – usually familiar favourites which have recently included Teenage Kicks by the Undertones! At the Christmas meeting in December we’ll be playing alongside the Singing for Fun group, so we’ve been practising our repertoire together, which has been most enjoyable and will hopefully sound good on the day. ‘You cannot be miserable when you’ve got a ukulele in your hand.’ Dennis Mitchell, Chairman of The George Formby Society. The group meets fortnightly on Thursdays, at 2 pm at Chilwell Road Methodist Church. New members are invited to arrive early to have someone to one support and be shown a few simple chords. The joy of the ukulele is that, with just a few chords, it’s possible to sing and play along from the start. Within the group, there’s a wide range of ability. Some are more experienced players; for others the ukulele may be the first instrument they’ve played – it really doesn’t matter. Songs range from rock, folk, pop and show songs to more traditional old favourites. As well as a range of strumming patterns, we’ve recently ventured into finger-picking which sounds lovely, but is a whole new skill to learn! We break for a cup of tea and a chat and finish with ideas and suggestions of songs to practise for the next meeting. Beware new members! If you’re not a ukulele player, you may be unaware of UAS (Ukulele Acquisition Syndrome). Several members of the group have already been struck by this condition. The main symptom is an irresistible urge to get another bigger/smaller/different ukulele. Sadly, having acquired a new one, the initial satisfaction is short lived and the craving goes on! 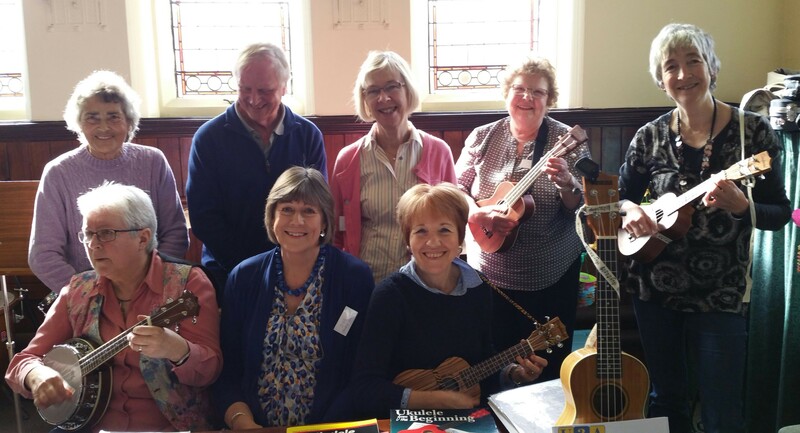 The Ukulele Group played three songs at the March Groups Fair and encouraged anyone interested to come along and give the ukulele a try. Our performance was enhanced by Jenny’s daughter, Becky, whose beautiful voice gave us the confidence to sing along as we played. We were pleased to welcome several new members at following sessions, which means there are now nineteen of us. A new beginners group may be on the way. New members are invited to arrive early so they can have a little one to one support and be shown a few simple cords; this means they can join in from the start. There’s a wide range of ability within the group; some have a musical background, for others the ukulele may be the first instrument they’ve played. To improve our skills, repertoire and to introduce some challenge, we attempt finger picking, a range of strumming patterns, and the occasional ‘Up down up slap, up down up slap’…! As our range of songs has grown, we’ve begun to create a songbook of masters, together with an electronic library of songs. If you’d like to give the ukulele a go, do come along to a meeting. We struggle, we laugh and we leave feeling uplifted. The group meets fortnightly on Thursdays, at 2 pm at Beeston Methodist Church. We started a year ago with a few enthusiastic beginners. There are now 14 of us! We’ve been lucky to have some more experienced players joining the group and while some people have a musical background, others don’t – it really doesn’t matter. At the start of a session we focus on new members who have a chance to learn the basics and then join in where and when they can with everyone else. The joy of the ukulele is that, with just a few chords, you can sing and play along from the start. We break for a cup of tea and a chat and finish with ideas and suggestions of songs to practise for the next meeting. Songs range from rock, folk, pop and show songs to more traditional old favourites. We’ve recently ventured into finger-picking Happy Birthday, patiently taught by Barrie, with varying degrees of success, but we’re persevering! 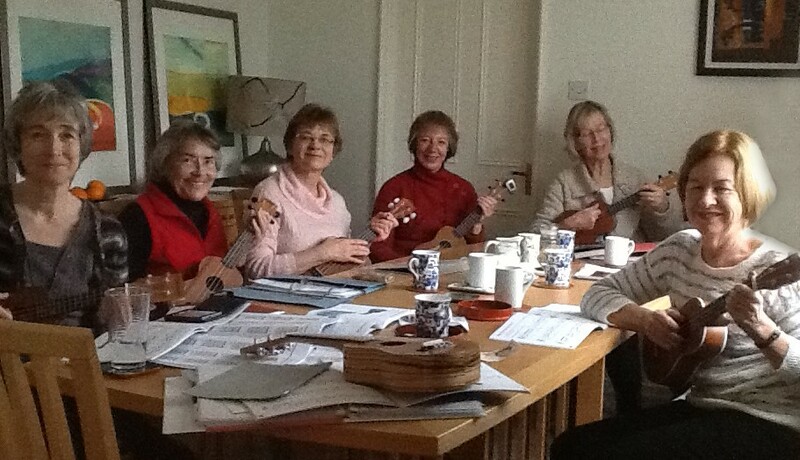 The beginners’ ukulele group had its first meeting in December 2014 and has met four times since then. We plan to meet fortnightly, on Thursday afternoons and are exploring various options for tuition which we hope to have at each alternate session. We have had a ‘one off’ session with a tutor who brought along his guitar to accompany our playing (currently This Old Man and Old MacDonald). We are all absolute beginners and are very supportive of each other as we learn, practise and have fun together. For further information please contact Kath Childs, 0115 9431331.